In previous blogs we've seen that the Growth Commission assumes an independent Scotland would achieve a GDP/Capita growth rate +0.7% pa greater than it would if remaining in the UK. The justification for this figure is extremely tenuous, relying on including Hong Kong and Singapore in their comparison set despite explicitly rejecting those countries' low tax, high income-inequality economic models. Remove Hong Kong and Singapore from the comparable countries' growth rate analysis and +0.7% becomes 0.26%. If this were the case, instead of the 25 years the Growth Commission assumes it would take to generate an additional £9bn pa of revenue, it would take 67 years. £9bn is of course less than the £10.3bn effective fiscal transfer Scotland received from the rest of the UK in 2016-17, something we would of course lose on day one of independence. 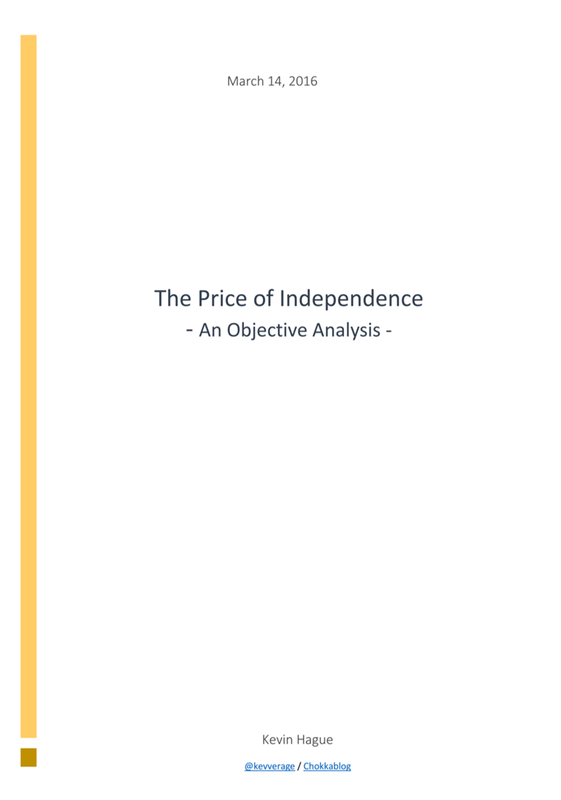 To test that assumption further: if we look back at the Independence White Paper, the equivalent figure used then was in fact only +0.12% pa - on that basis it would take over 140 years to achieve the aspired-for increase in GDP/capita. Finally, if we look at the performance of the three countries the Growth Commission explicitly cites as being those they seek to "learn in particular from" (Denmark, Finland and New Zealand) then the superior growth rate (using the Growth Commission's chosen data source and time period) becomes an immaterial +0.06%. It's a daft calculation of course, but on that basis it would take nearly 300 years to achieve the Growth Commission's target for superior GDP/Capita. Implications for Austerity in an Independent Scotland. The Growth Commission doesn't do us any favours when it comes to "showing their workings", but the projected deficit figures in section B are relatively easy to recreate because the analysis they use is not much more than "back of a fag packet" stuff anyway. I've recreated all of the deficit/GDP figures used in the Growth Commission report (by going back to the source data and applying their stated assumptions) and - because I'm nice like that - I've put them in an easy to understand graphical format. 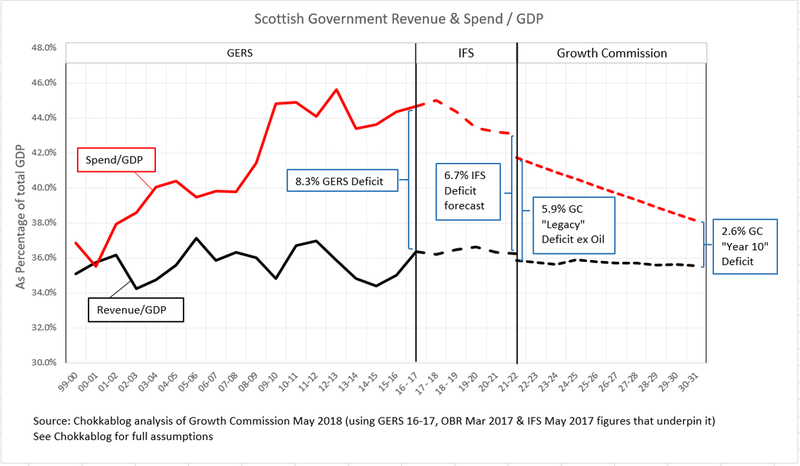 What we're looking at here is historic data per GERS, forecast to 2021/22 per IFS and then the Growth Commission's forecast to their Year 10 (per Figure 12-2). The black line is revenue/GDP, red is spend/GDP and therefore the gap between the two lines is deficit/GDP. 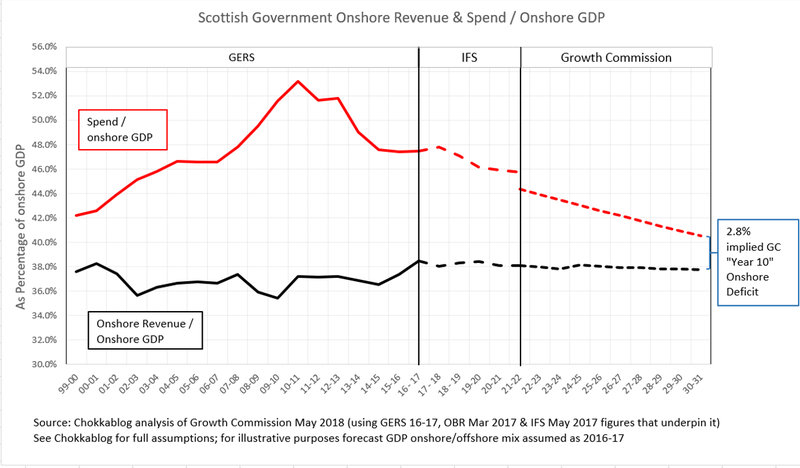 The step-change between IFS and Growth Commission figures is a function of the Growth Commission factoring in some additional Brexit downside (per the Nov 2017 OBR report), removing the relatively small amount of Oil revenue that was in the IFS figures (£0.7bn) and then making the very optimistic assumption that Scotland would save c.£2.8bn1 compared to spending allocated in GERS. 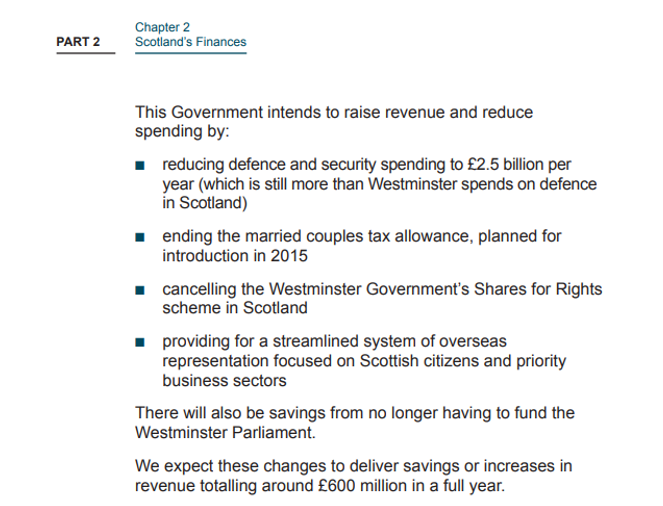 This £2.8bn assumed saving is more than 4x the £0.6bn that was assumed in the (notoriously optimistic) Independence White Paper and relies on some heroic assumptions1 which we may come back to in another blog. More importantly: no allowance at all is made for any "economic-shock" effects of Scotland separating from the UK. If the UK leaving the EU has negative economic consequences (as the Growth Commission assumes), it's frankly ridiculous for them to create financial projections that don't allow for any economic shock from Scotland leaving the UK (a market we trade 4x more with than we do with the EU). Now look at what the graph shows: the closing of the deficit comes pretty much entirely from reducing spend/GDP. Of course there's a numerator and a denominator effect here: the Growth Commission asserts that this can be achieved without real-terms spending cuts because GDP (the denominator) will be growing faster in real terms than spending (the numerator). The assumptions made are in fact extremely crude . They don't even refer to the +0.7% superior GDP/Cap growth rate analysis from earlier in the report, which makes me wonder if that analysis was added later as they scrambled to find some tabloid-friendly headline figures? The Growth Commission's assumption is simply that real GDP growth will be 1.5% pa and real Public Spending growth just 0.5% pa. Of course this means the numerator (spend) is growing more slowly than the denominator (GDP) and so spend/GDP reduces, as we see on the graph. But the point here is not just about whether or not we will be able to achieve real spending increases while pursing the Growth Commission's economic model (i.e. whether or not we can achieve the GDP growth rates they assume). It's also about what their hoped for 0.5% pa real-terms spending increase would actually feel like for the people of Scotland. To provide some context: over the 11 years between 1999/00 and 2010/11, average annual real spending growth in Scotland was 4.0% pa; in the 6 years of austerity between 2010/11 and 2016/17 average annual real spending growth has been 0.0%2 pa. Basically, 0.5% really isn't very much at all. 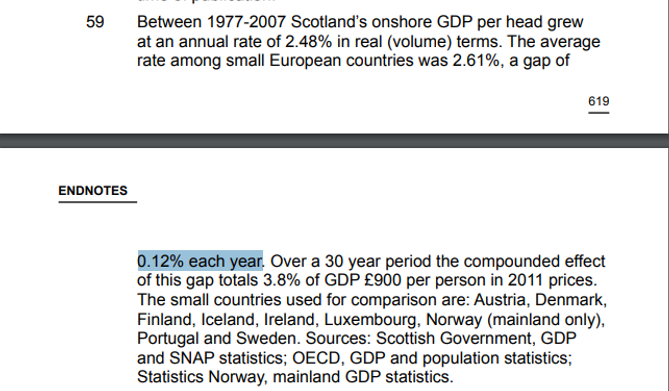 It gets worse though, because the figures the Growth Commission projects are absolute GDP based3 not GDP/Capita. Given the recommended push for greater net inwards migration, the impact on a per person basis of this hoped for growth would be significantly diluted. I'm really just playing with numbers here now, but 400,000 has been quoted as a net migration target: to achieve that over a decade would imply 0.7% annual population growth in Scotland, enough to turn a 0.5% real spending increase into a real decrease in spend per person. However you cut it, even if we were to achieve the optimistic growth rates and spending cuts the Growth Commission assumes, their commitment to fiscal prudence means the people of Scotland wouldn't see the benefits in terms of meaningful public spending increases. The picture is pretty clear: the Growth Commission assumes that we'd be investing a lower proportion of our onshore GDP in public spending in 2030/31 than we were even in 1999/00 - in any practical sense of the word, this means continued austerity. George Osborne would have been proud. This is fascinating - thank you. Some additional thoughts on the weaknesses in the analysis. On the growth side, leaving aside how you select your comparator group, simply saying that Scotland will match their historic growth rate advantage has no basis in theory or evidence. The literature on economic growth, and especially on conditional convergence, is very clear that these kind of big shifts relate to institutional changes. It seems unlikely that the move from 'heavily devolved within the UK' to 'independent' government represents such a shift -- if we look at say New Zealand or Ireland's change in growth rate since the 1980s, they followed substantial changes to economy policymaking, including the remove of trade protections, massive tax reforms, and so on. These kinds of changes haven't been identified by the Growth Commission, so it seems unlikely there'd be a growth surge (and as you say, separating from the UK seems likely to be at least as disruptive for Scotland as Brexit is for the UK, and probably much more so - the UK is losing a supranational economic body, while Scotland would be losing its nation-state government). On the fiscal side, the Commission don't seem to have paid any attention to debt dynamics within their budgetary plan, or its implications for their monetary proposals. If you've got a 7% GDP deficit (which seems optimistic given the SNP's spending promises and the costs of taking over UK government functions) and a plan to bring it down to below 3% GDP only over more than a decade, then in the meantime debt is going to balloon. That has a direct fiscal consequence: more debt interest to pay. So even assuming they meet the proposed trajectory seems unlikely to mean 0.5% growth in spending, but less -- if the debt/GDP ratio goes up by 20% over that time, then even at 5% interest rates you'd have an extra 1% GDP to find to cover interest costs. But fiscal problems don't exist in isolation from monetary policy. Let's start with the assumption of full sterlingisation, where Scotland uses the pound as an external party. That means that the Scottish government is no longer able to cover its own debts with its currency, but will be a private entity borrowing on its own risk, with no backstop provided by the UK government, and with only a very limited track record as such. At that point, continuously rising debt starts to look scary and so continued borrowing plans may require higher interest rates to attract investors. If those plans start to go awry, with election giveaways or growth coming in below-plan, then investors will demand further compensation. And if those plans look like they're coming apart, with no prospect of revenues meeting financial commitments, the Scottish government would find itself implementing Irish-style austerity. The proposal to create a currency board ('Scottish Central Bank') will surely hurt rather than help on credibility as well, when put alongside these kinds of financial plans. A currency board creates Scottish pounds backed one for one with BoE pounds, but in doing so makes it easier for a future Scottish government to meet liabilities by printing additional Scottish pounds to meet its debts. and thereby devaluing. So again, higher borrowing rates seem to be the order of the day, and especially so given the level of borrowing the Scottish government would be planning for in its first decade and more. If the SNP had picked the original group of countries again what would the additional gdp growth rate be updated to 2016?